Embark on a thrilling ATV-quad bike adventure that includes the most stunning waterfalls in the area. Operated by our partners at Arcanum Glacier Tours. After the driver guide whisks you out of Reykjavík, you will travel along a road that features wonderful waterfalls, ocean views, mountains and glaciers. After arriving at the Arcanum base camp, the guide will provide you with the appropriate gear and a safety briefing. 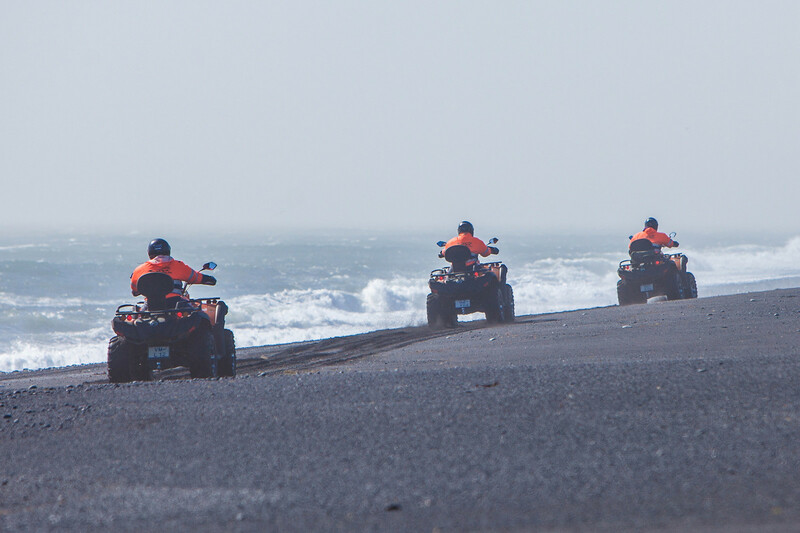 While on the quad bikes, you cross small rivers before heading to the magnificent black sand beach and field that have been formed from the nearby Katla volcano. On the drive along the black beach, you’ll enjoy views of the ocean, up Mýrdalsjökull glacier, and of Dyrhólaey, a small peninsula that is the southernmost part of Iceland. After riding along the coast, we stop by the famous plane wreck at Sólheimasandur. This relic has been resting on the sand since 1973. As you head back to the Arcanum base camp, your guide will lead the group along the Jökulsá river to the foot of the mountain. On the return ride to Reykjavík, we stop at the stunning waterfalls Seljalandsfoss and Skógafoss. A perfect end to this adventure filled day.